Here at St Paul's we loved this book and the chance to create an anthology of our favourite poems! We all chose different poems for different reasons and chose different coloured paper to create our own version of the poems. We collated them in book for our classmates to read. We didn't know that we liked poetry before this book, but now we know that a poetry offers lots of different options, almost like a sweetie Pick and Mix. Brilliant to see you using Pic collage to present your anthology! 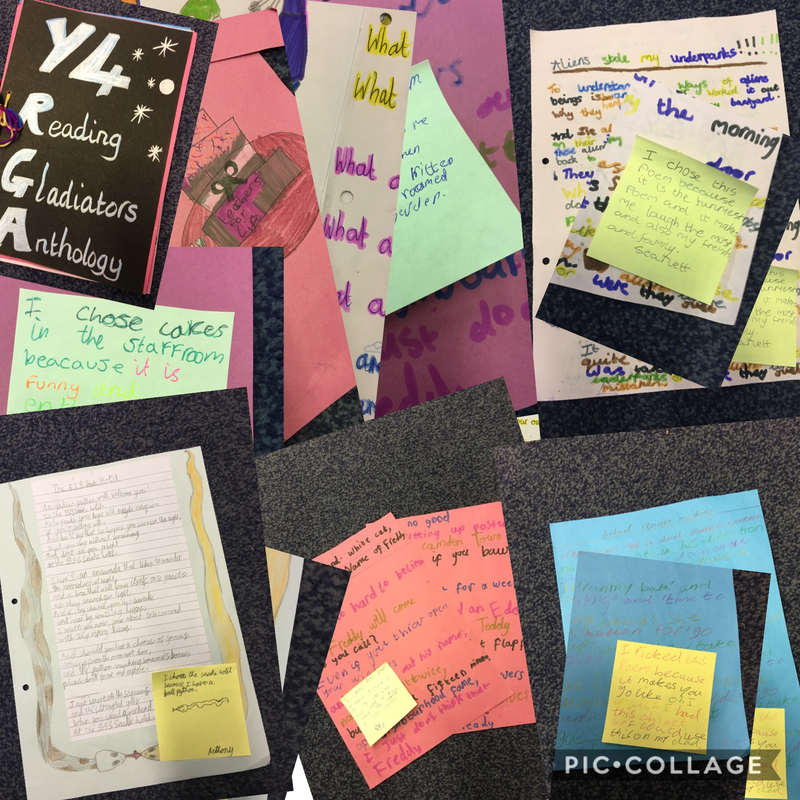 Excellent use of sticky notes too to add each child's reason for choosing their poem. Year 4 Reading Gladiators exploring ‘Town is by the Sea’ by listening to mining sounds in the dark with blindfolds on, then using charcoal to express how it made us feel. Could you work out what the sounds were? St Marie’s RG, Maryam, thought Sydney Smith’s illustration here was in the style of Claude Monet! What a perceptive comment! It also reminds me of another impressionist painter, Pierre Auguste Renoir. See if you can find some of his seascapes, including Sea at Sunset. What an amazing idea... or perhaps his grandad? You are thinking very deeply about this book, St Maries. It's very exciting to read about your conversations. St Marie’s RGs created an alternative ending/sequel to Web Wabbit- The War of the Wimbley Woos! What a lot of work you have put into your story ending! HAve a lovely Christmas St Marie's Reading Gladiators. This is our retell of Wed Wabbit, written in the style of the Wimbley Woos! A very efficient summary of the story here and beautifully presented too. Well done! WOW!! Amazing! We thought this was so hard we didn't submit for the challenge! You've really impressed St Paul's Gladiators!! Hi! This is Christ Church Walshaw's Wed Wabbit Challenge! We hope you enjoy it as much as we enjoyed reading the book! You've the rhyme scheme spot on! I also love the cheeky ending. I'm sure other gladiators will enjoy reading your poem. They’re not quite finished but we certainly enjoyed making them! Can you spot Wed Wabbit? Yes! and I hope Minnie has him firmly by the hand this time! We created story maps of the events so far…lots of great discussions! A story map is a great way to visualise the plot and a transferable skill to apply to any story. Good work Gladiators! A gorgeous green! Love the facial expression here. He looks great fun and also a bit like a gummy bear! Could it be a grey Wimbley woo? We drew what we imagined the Wimbley Woos look like and thought of words to describe their features. I love the eyebrows! Great language choices too. St Marie’s love WED WABBIT! Our Y4 Reading Gladiators are loving reading ‘Wed Wabbit.’ We’ve already found links to ‘Angelino Brown’ and have made lots of predictions about what may happen next! We can’t wait for the next session! It's true, the more we read the more links we find between books. Delighted to hear you are having so much fun! Hi St Luke's we are delighted to hear that you are enjoying Wed Wabbit so much. We all need a good laugh from time to time. Happy Reading everyone! We can’t wait to find out more about Fidge, Minnie,Wed Wabbit and the Wimbley Woos in our new book! We hope you enjoy the book as much as we did! At Kearsley West Primary school we have just started Reading Gladiators in Year 4 and we are loving it so far! We have made a list of angelic traits and are recording any non-angelic traits that Angelino demonstrates! Hi Kearsley West Gladiators! Great to see you. We found this with the mini-challenge submissions. You can post regular updates using the Manage Updates button and then send mini-challenge entries using the Submissions button. we look forward to hearing more from you. Year 4 Reading Gladiators worked together to create this montage of their dreams and aspirations. They used laptops to find images, wrote short descriptions and produced illustrations. Some interesting and varied dreams! The children have loved the text so far. Just Imagine comment: what an aspirational group of Gladiators. As a group, we talked about imagination. The title, A World of Pure Imagination, made us think of Charlie and the Chocolate Factory! We each chose something from our imaginations to create and put them together to create our world! Just Imagine comment: hello St Paul's, Bury. There were so many things that we liked about your artwork. The 3D cake was a great idea (it made us a bit hungry!). And that black spider loomed large and did a good job of representing the fearful side of the imagination. The artist Picasso once said, 'Everything you can imagine is real'. Do you agree? Perhaps you could discuss this with your teacher? Just Imagine comment: Your individual works of art combine very well to create a dramatic impact. The quotation that you have chosen is very apposite for the theme of the display. Our Y4 Gladiators are loving Reading Gladiators! They are super enthusiastic and enjoying our first book! Hi St Paul's, Bury. Delighted to see you out in the sunshine and pleased to hear that you are enjoying Angelino Brown. We look forward to hearing more from you as you travel further on your reading journey. Year 4 reading extracts from their books to make comparisons between the story and real life. Hello St Joseph's Ramsbottom. You look as though you are concentrating hard on your reading. We hope you are enjoying the book. Love the angel's eye-view camera angle!! What will happen to Angelino? We have predicted what might happen next to Angelino! Very perceptive Sedgley Park! I think there are some super seeds for alternative endings here. Hello everyone from a very sunny Bury! We are really looking forward to reading all about Angelino Brown. The first chapter had us in hysterics! Bye for now, catch up soon. Hello St Joseph and St Bede. Delighted to meet you. We are excited to hear more from you throughout the year. Happy Reading! I'm sure it did. All that burping and farting! I wonder what other emotions you will feel as you progress through the story? We have been making notes about some of the characters that Angelino has met so far! Hello Sedgley Park Gladiators! You've spoted some key characterisitcs here. Can you anticpate the roles that these characters will play in the story? I wonder if any of them will surprise us. Enjoy the book! We discussed the term ‘bloke’ and what it meant to us as ‘northerners’ from Bolton. I wonder what our gladiators in the South think? Originally 'bloke' was recorded as a London slang term. Very interesting to see your 'angelic traits' list. I wonder what other groups think? We had a great first session last week and really enjoyed starting the text! Good to hear Kearsley West! How about kicking back those chairs for one session and having your discussion on the floor! We had a great session drawing and talking about angels. The Reading Gladiators at WCPS are so excited about the year ahead! Hello Whitefield Gladiators! We are loving your angels in the Reading Gladiator office. We are interested to find out if the angel in Angelina Brown looks like your pictures. Looks fantastic, and the gave the children at Kearsley West some great ideas! Thanks for updating! Thank you for commenting, Rebecca. We look forward to hearing how your group are doing. Happy Reading! Frederick Bird Gladiators thought that these drawings were really good but might be improved with some glitter so we have persuaded our teacher to let us use glitter on our attempts! Hello to all Year 4 Reading Gladiators in the North-west. We are looking forward to hearing what you think about this year’s books. Be sure to post an update and tell us how you are getting on.